… I’m convinced that if we keep spreading kindness, it’ll eventually catch on. Pollyanna-ish? Maybe, but I’m OK with being called that name — I’ve been called worse! As for the seemingly sudden interest in etiquette and manners, especially when there are so many more important things going on in the world, maybe because hate, war and all around sadness dominate the headlines, we are searching for goodness in ourselves and others. Also, as our respective countries become further entwined via the global economy and our various ethnicities, cultures and religions clash and meld, we are compelled — or should be — to search for ways to get along socially and in business. As Emily Post, the grande dame of etiquette said, “Etiquette is the science of living. It embraces everything. It is ethics. It is honor.” I couldn’t agree more. Dear readers, if you know me at all, you know that this I believe (where’s Ira Glass?) with all of my pollyanna-ish heart. Please be kind — maybe even learn to use the right fork, but that isn’t as important — and maybe, just maybe we can all just get along. Come on friends, help me spread good manners! I promise, it won’t hurt and, it might even help. In unrelated business, happy Shark Week! The Preppy Princess (master of fun photo finding) shared this on her Facebook page and we couldn’t resist reposting. 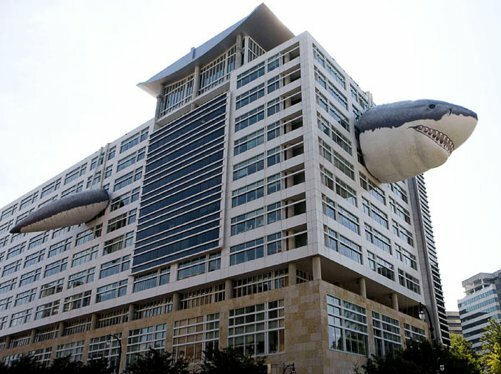 We wish someone would do this to our office building. Sigh.